• First come; first served. Walk-ins Welcome! 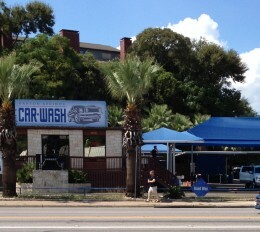 Get a chair massage while having your car washed! We provide a very thorough acupressure-style seated massage technique to affect a person’s over-all health and well-being, reduce stress, and leave one feeling relaxed, yet alert and revitalized. You receive massage to your shoulders, back, arms, hands, neck, and scalp while remaining fully clothed (no oil or lotion used) and seated on a massage chair designed with your comfort in mind. PLEASE NOTE: We take customers in the order they sign up. However, if you are not present when it’s your turn, the therapist may, at his/her discretion, take the next person on the list. NOTE: If it is a wet/rainy day, it’s best to call to confirm that the car wash is open and the therapist is present. NOTE: Effective February 1, 2017, our prices increased to $1.20 per minute. Payment Methods: Cash, Check, Coupons, Debit/Credit, VISA, MC, AMEX, Discover, Gift Certificates. We have separate G+ and Yelp listings for this location. If you like our service, please write a review. Thank you!